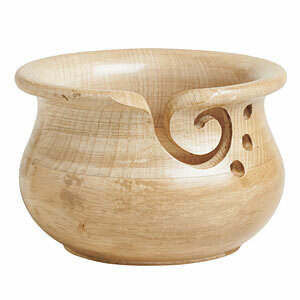 Place your yarn in this clear-finished maplewood bowl and keep it from running away. The spiral cutout and three holes not only form an attractive design, but also give you options for securing your yarn, even using multiple strands. The glossy coat brings out the rich detail of the natural wood grain while providing a luster and glow worthy of display. Bought this as part of the Tame Your Yarn set. High quality beauty of a bowl. Yarn runs smooth through guides, even coloration and finish. Fits a cake made from the swift and winder perfectly. I bought this maple bowl. I love it. I just wish it was a bit larger. That being said, it holds a ball of yarn beautifully. Beautiful, natural wood. Bought this as a gift for someone and am so pleased with the quality. The price is amazing, too! Beautiful bowl! I got this as a freebie during the early Black Friday sale. I had always wanted to try one and I am so happy with this. The yarn really does stay in the bowl and feeds nicely. I got the maplewood one and it is beautifully made. Love it.